We will be showing Skylight live from the National Theatre, London at 7pm on Thursday 17th July 2014. 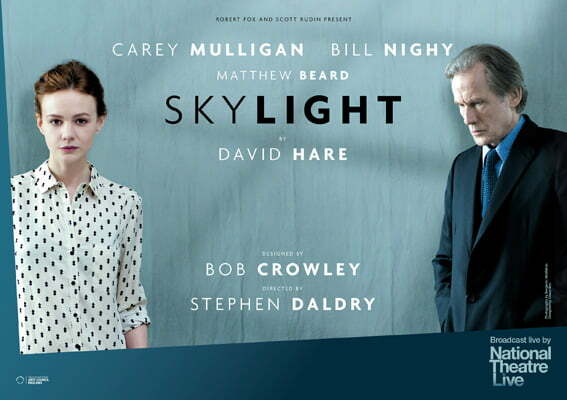 Bill Nighy and Carey Mulligan feature in the highly anticipated West End production of David Hare’s Skylight, directed by Stephen Daldry, broadcast live from London’s West End by National Theatre Live. On a bitterly cold London evening, schoolteacher Kyra Hollis (Carey Mulligan) receives an unexpected visit from her former lover, Tom Sergeant (Bill Nighy), a successful and charismatic restaurateur whose wife has recently died. As the evening progresses, the two attempt to rekindle their once passionate relationship only to find themselves locked in a dangerous battle of opposing ideologies and mutual desires. Bill Nighy, whose extensive film credits include Love Actually, Notes on a Scandal and The Best Exotic Marigold Hotel and whose stage roles include Pravda and the world premiere of David Hare’s The Vertical Hour on Broadway, plays alongside Carey Mulligan (Inside Llewyn Davis, The Great Gatsby, An Education) who is making her West End stage debut, and Matthew Beard (An Education, One Day, The Look of Love). Skylight is directed by Academy Award®-nominated director Stephen Daldry, who recently directed the sell-out West End production of The Audience with Helen Mirren, which was also broadcast to cinemas by National Theatre Live. David Hare is the author of 29 plays for stage, including Plenty, Racing Demon, Amy’s View,Pravda (with Howard Brenton) and Stuff Happens. His many screenplays include The Hoursand The Reader. Skylight was originally produced at the National Theatre in 1995, before transferring to the West End and Broadway, and won an Olivier Award for Best Play. Please arrive by 6.30pm to register and to order interval drinks if you wish. The George Hotel serves meals – please contact them directly on 01298 871382 if you would like to book a pre-show meal. This entry was posted in Theatre News and tagged Bill Nighy, Carey Mulligan, National Theatre, NT Live, Skylight, Tideswell Cinema. Bookmark the permalink.